In case you hadn’t noticed, MotoGP is greatly influenced by politics. As great a champion as he is, the influence of Marc Marquez over the sport owes as much to his nationality, perhaps. As a Spanish rider sponsored by Repsol, the powers that be in MotoGP are reluctant to punish Marquez, and he gets away with more than he should. Unfortunately for Marquez, he collided with an even greater force in MotoGP toward the end of the race in Argentina last weekend, i.e., Valentino Rossi. Although Marquez hit fellow Spaniard Aleix Espargaró at least as hard earlier in the race as he hit Rossi, the consequences of that contact could never result in the same backlash that will result from the Rossi incident. Rossi, in all liklihood, has more rabid fans than all of the other MotoGP riders combined. Perhaps the greatest racer of all time, Rossi has nine GP titles, including seven in the premier class. Rossi is also a team owner (Sky Racing Team by VR46) and competes with his team in both the Moto2 and Moto3 categories. Rossi is expected to own a MotoGP team, as well, as soon as he retires from riding. Rossi is aware of his influence over the sport, and is not shy about flexing his muscles when it suits his purposes. Right now, it suits Rossi’s purpose to punish Marquez. Although Rossi had finally, perhaps, forgiven Marquez for clashes between the two that culminated at Sepang in 2015, Rossi was furious after being forced out into the grass by Marquez in Argentina in the final laps, costing Rossi the 10 championship points he would have received for sixth place. Rossi will never get those points back, of course, and in the heat of the moment following the race, he stated Marquez has “destroyed” the sport of MotoGP racing with his dirty, unsafe riding. The Argentina race resulted in three separate conduct violations by Marquez, who incurred three separate penalties in that single race. First, Marquez stalled his bike on the grid, bump-started it, and rode it backwards to re-take his grid position even though marshals had told him to move to pit lane. For this, he was punished with a “ride-through” of the pits during the race. Second, he ran into the back of Aleix Espargaró, and was punished by being forced to relinquish a position during the race. Finally, as a result of the incident with Rossi, he was assessed a 30-second penalty, which pushed him back to an 18th place finish (ironically, still one position ahead of Rossi’s final position in 19th). Has a racer ever committed three, separate, riding infractions resulting in three separate punishments during a single race prior to Marquez in Argentina last Sunday? If you can think of one, let us know in the comments section below. Moving forward this year, it will be interesting to see if Marquez receives any additional punishment for his conduct during the Argentina race, and what Rossi and his allies push for in that regard. Stay tuned. Marquez is a bum who should be thrown out of MotoGP. I would urge everyone to take a look at David Emmett’s piece following the Simoncelli Pedrosa kerfuffle from 2011. Marquez imho was guilty of the same impatience. Reading the comments below his piece, it’s pretty clear that many were taken by Super Sic’s argy bargy style. It was the apopthesis of the type of chaavy followership that the Yellow barmy army prioritized, so long as only the no.46 practiced it (and had gotten away with minimal sanction previously). It was inevitable that there would arrive a day when you’d have a rider with a devil take the hindmost attitude take this dynamic to a different level. That isn’t 46’s fault per se, just the type of fans he opened the sport to. In my mind, Rossi made a fundamental error in the post PI presser in Sepang, when, without evidence, he accused a keen rival of favouring his teammate. Psychologically, he hasn’t adjusted to the fact that 93 is a different breed (along with Zarco and Iannone to a lesser degree). As it is, he enjoys no machine advantage. His only arsenal is the psychological. And in that regard, 93 is hard as nails. I admire everything Rossi has achieved. He’s a titan. It’s a pity he can’t get his head around the fact that he cannot beat MM93, much the same way Biaggi couldn’t accept Rossi was just a better rider. For me, that’s poor sportsmanship on Rossi’s part. Seems like if rules are not followed by the organizers then this really isn’t a race or a sport but a spectacle like WWF. I may just skip the entire sport and just read the highlights at the end of the year. Of course a statement by DORNA could fix this. Everybody needs to remember that Marquez has a history of this BS in every class he’s ever raced in. That he’s Dorna’s babyface and Spanish is his only saving grace. Were he a holder of any other passport, you can bet he’d be heavily penalized. His other saving grace is that he is the best, and most exciting racer in motogp. Also, he was heavily penalized. He lost all points, AND had to listen to Rossi whine for hours. Isn’t that a human rights violation or something? 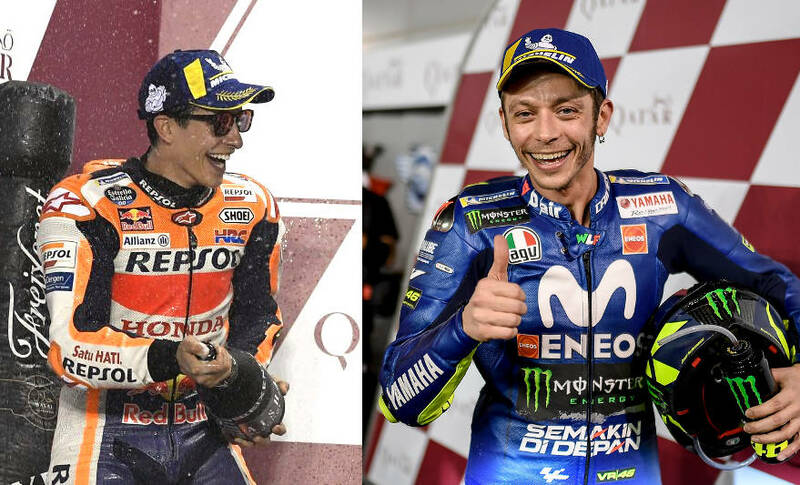 OK, if Rossi is such a political force in MotoGP, and Dorna is Spanish, and Rossi feels that aggrieved, why didn’t he take his helmet off and pummel the crap out of Marquez when Mark came to him? That would be something worth talking about. A lot of people are running their mouth, but no one is putting real force behind their words. Sometimes the message is worth the price. Because hitting someone with your helmet would land you in jail and in Rossi’s case, banned from FIM motorcycle racing for life (he owns teams) so no, delivering a message that way is never worth the price. I remember Rossi himself bumping out Sete Gibernau at Jerez in ’05–in the last corner! What comes around, goes around! The differences in the 05 and 18 collision are quite obvious. Rossi had the inside line on both incidents. I agree. Oooh boy I was waiting for a swing from Gib when they got next to each other. Twice recently Marquez made “suicide” attacks on Dovizioso in the last corner of a race. We all commended Marquez’s grit and talent and desire to win. But, my humble opinion is that disaster was avoided only because Dovi expected it and adjusted his line. Further, being in the lead on the last lap with a fast guy on his tail, Dovi had to make adjustments to protect his lead. This is fair and so too then are aggressive overtaking maneuvers. When you’re mid-pack midway through a race, there are few blocking maneuvers in play. Thus, the passing rider has an obligation to respect the rider in front and steal the race line prudently. For those people that think Rossi should have ceded the race line, you underestimate the talent of even the slowest guy in the field. Nearly all of these guys have been champions in the past in other classes. They’re incredibly fast and gifted and pulling off a top 10 finish is a BIG deal in MotoGP. I’m sure Rossi, Dovi, Vinales, Petrucci, et al, were all operating at 100% from start to finish. The riders and their efforts have to be respected not only by other riders, but by the fans as well. On to Austin….looking forward to the rise of Rins, Miller, and Zarco. The future is bright! I”m usually of a like mind to Dirk, but not on this one. If it made any difference at all who MM hit, he would have been disqualified on Sunday. I’ve been a huge motorcycle racing fan for over 30 years, and I raced myself for 7, and I have never one time, ever, seen such a display that so clearly deserved disqualification. Marquez is the most talented motorcycle racer since Rossi, but his judgement is awful. If he were a never-in-the-top-5 rider and did all of the things he’s done, he’d be out of the sport by now. Just wanted to add the obvious: the fact that Dorna is a Spanish owned company and MM is their little princess girl-faced Spanish choir boy. That ridiculous smirk on MM’s face, what he calls a smile, makes me puke a little into my mouth. I recall the days of calling Provologna here out for writing style, wacky opinions etc. In 1971 (this dates me) I attended a short track race in Madison Square Garden. Among the riders competing were Gary Nixon, Dave Aldana, Mark Brelsford, Jimmy Odom and an Englishman named Barry Briggs. In his heat race Barry Briggs crashed taking out the entire front row. For this he was moved back to the second row. At the start, he dove to the inside and took out the front row again. For the re-start, he was moved to a spot behind all of the other racers and started last. It was great, the crowd went crazy and even though Briggs didn’t qualify for the main, he stole the show. The race in Argentina kind of reminded me of this. It occurred to me that Moto GP needs to have a handicap rule of some sort that requires Marquez to start behind all of the other riders just so we can see what he can do. Obviously, the speeds and therefore the risk in Moto GP are somewhat higher than short track, but it would make for a good show. So… you want to give him more targets to take out byt starting him at the back? He’s been doing this forever and is the Repsol, Dorna darling so he’s got a free pass. Until cash cow Rossi retires he’s the only one that can say something and get Marquez a talking to. Get serious. motoGP is an inherently dangerous activity. We don’t need those involved who flaunt the rules designed to create a safe racing environment. Either Dorna allows MotoGP to become a demolition derby, or they don’t. Everyone is bringing up things that happened years to go some how justify not punishing Marquez, but the videos of the incidents show they were not the same. Often still not good passes, but there was a very narrow dry line on Sunday, Rossi was in it, Marquez was not. Marquez then seemed to push Rossi overly wide to control his own excess speed. I’m not saying ban Marguez or anything, the guy is crazy talented, but the penalty needs to be enough that he learns that possibly injuring or killing another rider is not going to enhance his championship chances, it’s going to kill them. If Rossi is riding slow, he should just get out of the way. He had a nice soft landing on the grass, picked up his bike and finished the race. He really should just STFU. No rider in front of another has an obligation to let another person pass them. The rider in back in obliged to “find their own way” past other riders and do it safely. You realize we’re talking about racing, right? Being polite and letting your competitors past? Are you serious? Rossi was broadsided hard. I’m surprised he didn’t suffer a broken leg from the hit. He has a right to complain to the people who matter. But he doesn’t need to drag it out IMO. That was trolly on my part. MM was penalized, probably rightly. But he was in a zone – something like 4seconds a lap faster than anyone in a sport that counts 100ths of a second. In that slow curve he must have felt he was going 30km/h – sadly physics wasn’t in the same zone. There was room to pass, the tires couldn’t handle it. But the idea that he’s using people as bumper cars, and risking their lives – that’s hyperbole. I like the title of this article. Seems like Marquez is of the camp that believes “If at first you don’t succeed, try again” because he kept hitting riders till he found the right (Wrong) one. It didn’t change the championship because they both finished the same. Dovi will not be able to keep up to the extent that Honda and Yamaha can. Vinales is not consistent. So Rossi and Marquez will still be up the front. All said and done, Marquez was pretty clueless about riding in the rain which is rather odd considering he rides dirt tack, but he sure blew it this time. It was funny watching Val’s friend shooing away Marquez in the garage. It did change the championship as Rossi lost the 10ish points he would have gotten had he finished 6th, and Marquez likely lost more than that. Dovi was second last year with a small chance in the last race to take first, saying he can’t keep up seems overly pessimistic. Not good in the rain? Sent to the back of the pack – penalized an additional spot, and still in contention for the podium? Whaddya talking about. If Rossi wants to cruise around for 6th place, he should let others use the racing line. That wouldn’t be racing, would it? That’s called commuting on public roads. You don’t understand the concept of racing, do you? If you think it’s ‘cruising around’ to be in 6th place at a MotoGP race, then show us how fast you are, Peter. A very trumpian approach– highlight the wrong thing and divert attention away from the most serious violations– the MM’s action on the start grid. He should have been black flagged for that instead of just a ride-through. Marquez knows the difference between a close pass and punting someone off their line. The idea that it could cause an incident was secondary. All racers make this mistake of trying too hard once and a while. I have punted someone off their line trying to make the extreme pass work. I knew that once I’m out in front of that rider I will drop them. If you have raced you know the frustration of being held up by someone on the racing line while you are a good second or more quicker per lap. When you are 25 years old you tend to make these tough passes and raise your hand and say “I know that was a sucky thing to do. Sorry. See you after the race.” He thought he could pull it off cleanly and it was anything but clean during the pass. Then last year when I was club racing at 55 years old I didn’t make passes like that. I saw these kids making passes like that on slower riders from the wave 1 SV class out with us 300’s and I would shook my head. I knew it was time to retire and walk away. Is it time for Rossi to retire? I got good results club racing as an old timer. But I wasn’t in the same frame of mind as an 18 or 25 year old. I don’t think Rossi is either. He wants to keep it clean and that is not surprising for a 39 year old. I’m with you Tommy. I gave up club racing because, at 50, I’m not taking chances like the 25 year olds. I’ve had 2 clavicle injuries in 20 years of racing and can’t afford to take another TBH, lest I lose my ability to ever use those arms again beacuse they were that bad. Even early on, I stayed out of the “bloodbath classes that the middle weight supersport is and even the heavyweight class. There were always highly skilled riders in each but the higher percentage were those way too willing to take excessive risks. And this is where Marquez is. He only had what looked like an opening from the front or rear view, but sideways, he was way too far behind Rossi to make a clean pass. He came in so hot to catch up to him in the corner, he’d have never made that corner on his own. He’d have blown right through it and into the gravel. Even with the hard bounce off of Rossi, he still had to use up all the track to stay upright. Complete recklessness. Dovi dealt with that most of last season. Except Dovi knew Marquez was going to try the overly aggressive passes and let him blow on through, only to dive back inside and retake his line back in the lead. Marquez would repeatedly overcook corners when battling Dovi. If Dovi had held fast to his position, he’d have been torpedoed as well. This is the problem I have with Marquez. He just has no regard for the safety of other riders and is willing to ride over his head. He’s more than capable of making all his passes cleanly. Even hard passes can be clean. It’s going to take someone being permanently injured or killed by him before he wises up. And resultantly booting him out of the series is the only way he’s ever going to wise up. I saw him maturing in his attitude a lot last year, then it apparently was lost over the summer break. The number of people who want to write a rulebook based on three incidents correlates strongly with the number of people who wear a yellow cap on a Sunday. And giving points to riders that don’t finish? You might as well have a superpole race that decides who-would’ve-finished-where. Utter nonesense. There was a far more serious incident that took place on the Saturday between Moto3 riders Aron Canet and Makar Yurchenko. Considerably more dangerous than what Marquez achieved in his three crazy acts. That was an opportunity for the organisers to lay down the law, and given the severity, rebrief the riders in all 3 classes on what is at stake and who is in charge. And what happened? They let it slide. And now they’ve got the whole (racing) world waiting. The cult of personality, epitomised by Rossi, has got MotoGP in the position where riders can be too important to control. The headline of this article runs on that basis. Rossi’s biggest regret about the 2015 season is that he didn’t get to emulate Senna by crashing into Lorenzo in the last round. What would that have done to MotoGP? And Rossi just doesn’t care, as he can do no wrong in the eyes of 70% of fans. We’ve seen that before with Loris Capirossi, who won 2 world Chamionship deciders in that manner. Oh, and he’s the MotoGP safety advisor (or similar) these days. Talk about poacher-turned-gamekeeper. MotoGP is in a really good place now, and the races are compelling. Both Rossi and Marquez need to be reigned in, but the whole field needs to understand that when they make one of those lunges, there are meaningful consequences for collisions, beyond the immediate aftermath. I beleive that there’s some control required by the organisers going forwards. It certainly shouldn’t escalate. And the strong feelings within the paddock should allow Race Direction to show some strength against those who have been deemed untouchable. I’m more of a Dovi fan, but how does Rossi need to be reigned in? Marquez risked MotoGP’s cash box by forcing Rossi into the grass, that’s why it’s a big deal to Dorna. Killing people racing won’t sell, sure people will watch 40 second replays on You Tube, but you did’t have people watching whole races because Simoncelli died. 3 penalties in one race is 2 too many. I agree there needs to be meaningful consequences for collisions, more than what Marquez suffered. MM is the cashbox of tomorrow- Rossi is only relevant now in as much as he clashes with MM. He’s costing on momentum, but it’s a downward arc. He should thank MM for giving the press a reason to mention him. Despite your man-crush on Marquez, he’s never going to command the kind of following that Rossi does. This latest race has fans, fellow racers, ex-champions, and the motorcycle press all looking at Marquez with disdain. I believe that a demerit points system should be enforced where all riders start with X points. Demerit (-)Points expire after a fixed period. Racing licenses should be suspended as punishment when a rider reaches zero points until the demerit points expire. Dorna and riders can decide the points for various offences. An independant body or (AI) should have access to all telemetry/video etc to assess if riders have made deliberate contact. If every rider in the field rode with the same level of aggression as MM without fear of meaninful punishment then we will end up a demolition derby. I have to give this race credit. I had not re-subscribed for the year. Immediately after the race, I read the results @ MotoGP.com, and also a headline referencing the chaos during the race, which excited me so much I could not resist re-subscribing and watching the race. On replay, after the delay, and by the time the race started, I had already forgotten who finished first, and it was one of the all time most exciting races I’ve seen, almost beyond belief. And again, the fact that MM was lapping so much quicker than anyone else on the track, only increases more guilt on him and demands further discipline. MM rammed VR at turn “X.” If MM had simply tailed VR through the turn, by the next turn he would have lead VR and been reeling in his next target. MM would have finished at least 5th, making big points, rather than netting zero. If anyone thinks Puig has not drilled MM a new alimentary canal since that race, think again. Honda does not participate in this game to intentionally give up points because their star rider has an avoidable personality defect. Honda’s CEO has certainly called Puig to account, and Puig certainly flowed the brown stuff down stream into MM’s lap. At least that’s my guess. What the heck happened to Norm? Miss his wisdom Re. this stuff! Sete Gibernau not sure I got the last name right. Anyone who is a MotoGP aficionado will remember when Rossi “deliberately” rammed him after threatening him before the race “he will never win another GP race”. so let’s not paint Rossi as an innocent angel. Not pardoning MM’s move, but it looked no worse that a lot of other bumps. Rossi’s prior actions are as unrelated to MM’s subject violations as is the man in the moon. If VR deserved MM’s ramming violation, then unrelated Racer “A” is welcome to ram MM, unrelated Racer B is welcome to ram A, etc., ad infinitum. There is a grotesque lack of logic expressed in this sentiment. Sete won and Rossi illegally punted him. Alright,this has gone to far. Dirk,really? “Ran into the wrong guy”. Why is that? Is Rossi Above all the other riders? Or is he a Mob boss? One thing we do know,he’s not as fast. Not just Marquez but many other riders as well such as Dovi. And there is the problem, He can’t accept that fact nor can his fans. So lets all of us do this,put yourself in Marc’s shoes as he’s approaching the turn of the incident. Having watched the video and slowed it down frame by frame it is clear Rossi made one big mistake in racing,he left the door open. Any one of us who have raced,myself included most likely would have taken that inside line like Marc did. And even better lets switch this around. Rossi stalking Marquez and the same situation arises. Judging from past history Rossi goes in just like Marquez did. I challenge any one of you to dispute that. Quite frankly I would throw Zarco in there to, same move. Heck,in this race Zarco did just that in a much tighter space, and with no penalty. Argentina race was a bit of a train wreck right from the start. Lets ALL move on, hopefully lessons learned and enjoy the racing. If you think Rossi left the door open, and Marquez was justified in his move… well I don’t want to share a track with you. Would you “share a track” with Rossi? Study his past races over the years and then report back. Starting with Sepang 2015. I was there, at the track, at turn 14. Marquez made several passes that would definitely not stick prior to the incident. This was an obvious attempt to slow Rossi. Rossi did slow him down at turn 14, yes. Rossi did ask him “WTF!??!?”. But Rossi did not kick him off the bike. Marquez DID ram Rossi, and laid into him with his shoulder, which caused him to fall. Marquez slowed Rossi 5-6 times in the previous laps, Rossi slowed him once. Marquez rode into Rossi. He did it a few races prior as well, and fell then too. And now he’s done it yet again. Yes, the door was open. Was Marc close enough to “enter”? No. With the speed he carried he wouldn’t have had a chance to stay on the line he picked. Bumping Rossi slowed him down enough to stay on the tarmac. The guy is a raging bull(y) and no matter how talented he is I can’t force myself to like him. That’s why I couldn’t like Simoncelli, too, God rest his soul. Did you miss “opinion” in the title? Where is Dornas’ written explanation? How was the race allowed to start? What did Dorna think was going to happen, sending Marquez to the back of the pack? Where is the slow motion video, showing Rossi doing his famous “block” move. Did Rossi’s pit board warn Rossi of Marquez coming at 2 seconds faster per lap? This is like watching morons with gunpowder, playing with matches. Oh, boo hoo, we’ve got 250+hp machines riding at 200 mph, there’s bumping and banging going on, and we want sissy arsed rules to dictate Moto GP? If it’s too hot in the kitchen, go lay on the porch with the hounds and the women. …writes the “man” who would be too scared to race a Vespa. My Tmax does 110 mph before “Fred M.” pussiness pulls his head out of my exhaust. LOL @ a Tmax scooter. Your 30-something rear wheel horsepower must make you quite the force to be reckoned with on track days. MotoGP riders don’t need some scooter-riding pansy like you telling them what rules should be in place for safety. There have been far too many of them killed, severely injured, or paralyzed to take that kind of cavalier attitude about their safety. LOL, yep I must be a sissy, if you say so. Apparently I’ve been a sissy since I started to watch Kenny Roberts come up through the ranks. I know I was a sissy when I rode a bike to Alaska and I’m pretty sure the White Rim Trail at Moab reduced me to Sissy status. This sissy says let them race but don’t smother the sport with suffocating rules and regulations. Before Rossi vs Marquez we could have Hot Dog vs Fred M. in the undercard match. Watching motorcycle races on TV, reading motorcycle magazines, and riding recreationally since the 1970s doesn’t qualify either of us to suggest that MotoGP riders are sissies because they want some safety rules. It doesn’t “smother” the sport to prohibit dangerous riding like what we saw from Marquez. This isn’t NASCAR. MotoGP bikes don’t have roll cages, crumple zones, wrap-around seats designed to protect the spine and ribs, five or six point harnesses, and more than three thousand pounds of metal surrounding the racer. Let’s just watch Demolition Derby, instead. Hot dog, you should watch NASCAR racing. I think you’d like it much more than MotoGP. It’s asinine that a ramming Rossi off the track results in essentially the same penalty one gets for rolling forward two inches before the lights turn green. It’s even more asinine that Marquez’s earlier penalty for his overly aggressive pass with contact on Aleix Espargaro was just to drop back one place. 1. A penalty for a jump start where any part of the front tire is still behind the line should be a position loss during the race. 2. A penalty for aggressive riding with contact to another rider should be a ride through. 3. A penalty for aggressive riding that causes a crash should be a black flag. 4. Any rider who receives three penalties in a single race should be suspended for the next race. 5. A rider who loses positions, or who DNFs, due to contact with the penalized rider should retain the points he would have earned had he held his original position at the end of a race. So if you were in 3rd, you should get the points for 3rd, as should the rider who actually finishes in that position. Maybe this could be predicated on having completed at least 2/3 race distance. Agree completely with ideas 1-4. #5 is more problematic – IMHO and should be less of a problem if 1-4 do their job. Thanks. I think #5 is reasonable because it doesn’t deprive any other riders of points. If you’re in 3rd when you get taken out, you get the same number of points as the rider who finishes in 3rd. As usual, these things only matter when it happens to Rossi. Will we only have a rulebook based upon his feelings of being hard done-by? Like dashboard text messaging becasue he didn’t see/ignored his pit board? Rossi crashes on a cold tyre at Misano and there’s an enquiry towards dashboard tyre temperature indications! Dovi has been on the end of more ‘take-downs’ than anyone. The mob says – “Nothing”. Pedrosa has also been hard done by regularly. Where was this rhetoric when rossi took out Stoner in Jerez? Can you not see what is happening here? One racer dictating the whole sport’s approach. It’s time to decide whether we are MotoGP fans or Rossi fans. Because the two have become an either-or. And it threatens to strangle MotoGP. No. They matter when they happen to any MotoGP rider. Marquez was penalized by race officials three times, only the last of which involved Rossi. The rules I suggested would apply to all riders equally, regardless of who they are or who they endanger. What “approach”? The one where you don’t get to ram your opponents off track at race speeds? Marquez’s riding was condemned by television commentators, the motorcycling press, and current and former racers. Neil Hodgson said Marquez showed “arrogance” in his racing. No, it’s time for you to decide whether you hate Rossi more than you love MotoGP. I suspect that you do. I’m not even a MM fan in particular. And I appreciate what Rossi has done and continues to do on the track. But when you’ve attended motoGP races in europe that have the feel of a political rally, when casey Stoner was booed and heckled for having the temerity to take on and beat Rossi, (which is now par for the course, along with assaulting fans of JL and MM these days), then your mind moves one of two way. Either comply or stand up to the insanity. Like I said, riders like Iannone and Pattrussi have been far more dangerous, but the rukles that are there have been applied. It’s the ‘game-changer’ people call out whenever the Yellow One is affected that marks out where people stand on these things. There’s certainly a lot of politics involved and enough emotion to go around on this issue. No one is lily white either including us fans. Rubbing is racing as they say, and we all like it when the racing gets tight. But it’s up to the officials to make sure things don’t go over the line. Because once they do, very bad things can happen very quickly. In this case, I think it’s important, vital even, that race direction take the extra step of placing an additional penalty on MMs actions. Take away race (not championship) points, alter the starting position on the grid – make it hurt enough to send a clear message to all the riders. Explain to everyone why this is required so there are no further excuses. And while you’re at it, fix the stupid loophole that lets everyone go to the pits after they have already completed the sighting lap and lined up on the grid. Once you declare a wet race, that’s it – you got to stay on the grid. The only person hurt was Pedrosa, and I don’t think MM is responsible. Rossi is so upset because he has made a calculation: He can finish consistently 3rd 4th or 5th, grab a lucky win or 2 and be in contention for the championship. This could work because there are so many very good riders who can carry the weight of breaking up MM’s victories. Rossi is still a very good rider at this point, maybe 4th or 5th – but on the way down. MM messed with his plan, a plan which is really the only way he’s going to get #10. Clever, but not herioc. MM rode well but totally irresponsibly Sunday. He has no business punting other riders off the track no matter how fast he might be that day. Rossi was entitled to the points that his riding earned — and MM took those away by running into Rossi. If Rossi is knocked out of contention for the championship by MM (again), that would be both tragic and infuriating. A championship is not about how you ride on your best day — it’s about how consistent you are throughout the season. Nope- it’s racing – you’re entitled to whatever they final results are. Rossi is entitled to whine, and I’m entitled to say he’s full of poo. If you park in the racing line, someone’s going to move you aside. Rossi is never getting anywhere near a championship again – so your anxiety is misplaced. No, you will not be “moved aside”, not in MotoGP. This isn’t club level go kart racing. If you’re faster, ride around the slower guy. Beat him fairly, not by taking him down. That’s a coward’s move. Peter, I’m sorry that you mistook my comment as an invitation to debate. It was me providing factual information. It’s not a point for debate, as Dave also told you. I did. There’s nothing revelatory there. What is revelatory are the reactions of all the parties involved. You haven’t addressed those reactions, and they tell the entire story. If Zarco was at fault, then why didn’t Honda accuse him of foul play? Why didn’t Zarco feel any need to apologize? Why wasn’t he penalized? Why didn’t Dani or Puig make an issue of it? Similarly, why did Marque publicly admit to his error, although he tried to deflect blame by calling it accidental, not pre-meditated. Why did Marquez and Puig go to Rossi’s garage to apologize immediately following the race? Does Marquez normally do that, whenever he makes a hard, clean pass? Does Puig [i]ever[/i] do that? In your zeal to exonerate Dani while demonizing Zarco by drawing another false comparison, you’re missing the forest for the trees. All the super-slow-motion, frame-by-frame, completely-out-of-context Zapruder film analysis you’re attempting to do here doesn’t change the obvious fact that is clear to everyone not waving an orange and blue “#26” flag. Marquez crossed the line, multiple times in one race. He rode with willful recklessness. Zarco did not. It’s as simple as that. Great. Not only did the above response go into moderation, it also didn’t appear where it should have, which was in response to mickey’s response, below. Rossi going off on Marquez is just feeding the drama. He could have focussed on how is Dorna dealing with the aggressive riding issue. But Dorna is the meal ticket, so don’t go there., To me, the issue is managerial leadership values. Seems to me, if you are promoting story lines and gaining interest that way, then MM hit exactly the right guy. Unfortunately you’re right. It’s not like the Senna Prost issues resulted in decreased interest in F1. Bob Hannah had a lot of fans (myself included) and he sold a lot of YZ250s. It is without a doubt that Marquez should receive not only for punishment for his actions, but be further scrutinized in all this seasons upcoming races. Yes, MotoGP is competitive. Yes, MotoGP is dangerous. But bringing such rash behavior to the sport not only, in this case, has cost riders potentially vital championship points ( especially in Rossi’s case ), but also had the potential of causing injury to his fellow competitors, that could put them out of several races or even the rest of the season. Unacceptable!! Talent only goes so far in band-aiding his actions, and having the powers at be turn a blind eye to them. No one should be above the safety of their fellow competitors. There was no reason for his actions, which showed obvious lack of concern for anyone else on the track for the possibility of obtaining more points. His pace was fast enough to have gained him points without determining that the other riders were “in his way”. Let him be ousted for a race or two and see if that might temper his attitude in the future. Too big an issue? What about the issues during the practices. Marquez is way too aggressive and will either kill himself or someone else! In the race, with his speed he could have overtaken in any other place on the track. His comments defending himself, not sure if you watch MotoGP were lame. While I am as big a fan of Rossi as anyone, I believe he has made too big of an issue out of this incident. Yes, he was punted off the track through no fault of his own, however many of us recall him giving as good as he got over the years. What goes around comes around. Racing at this level involves the world’s fastest, best riders and bikes and all of them want to win at just about any cost. It’s not club racing or a casual track day. It’s all or nothing for many of these riders. You can bet that all of these riders know this. I can’t help but admire the drive and determination that fills Marquez. Rossi will surely get an opportunity for revenge at some point in the season. That doesn’t mean he should be looking to take Marquez down, but there are certainly other ways for him to impede or punish Marquez, particularly at tracks where Marques doesn’t have such a huge advantage in pace, like he did in Argentina. Rossi is smart enough and wily enough to extract his revenge in a way that is within the rules. Myself, I think the added drama is great for the sport and I can’t wait for COTA. It would be great to see them gridded next to each other and duke it out for the entire race. Silliness. There is no “extracting (sic) revenge” here, for Rossi. No matter what he does to Marquez going forward, he can’t retrieve those lost ten points that Marquez cost him in Argentina. Also, everyone loves to point to the 2005 incident with Sete as an example of Rossi doing the same thing that Marc did to him in Argentina. Nope…not the same thing. Sete left more than a full bike-width open to Rossi in that final corner. He left the door open. Rossi moved up, and Sete tipped it in. Bam. Not the same thing. In Argentina, Marquez barged into the space already occupied by Rossi. He did the same thing to Espargaro. Conversely, Zarco did not do the same thing to Dani. People seriously need to stop drawing false comparisons to justify Marquez’s out-of-control behavior. BTW, you could also make the case that MM purposefully took VR wide after the contact to run him into the grass. and one could make the case that aliens are living in your porridge – I doubt it though. If you watch the videos considering the context, no one is more conclusive than the other. That is the point. I was not a fan or subscriber (if that was an option) in 2005 so I did not “live” the Sete incident. However, I have watched the videos and am sorry because I just don’t see a comparison given the context in that it happened in the heat of battle between the two. As far as last weekend, it seems to me that VR was pretty much blindsided by a charging MM, just my opinion. Regardless, I have to agree with VR’s comments when he said you have to be able to trust the other riders you’re racing with. Imagine the resulting intimidation factor when charging into a corner knowing MM is directly behind you. VLJ, I completely agree with you. I think that Marquez went in there intending to use Rossi as a berm to check his excessive entry speed, knowing full well if Rossi were not there, he would have run wide. I think that Dorna needs to create a rule to let riders retain championship points when they lose positions, or are taken out, by another competitor’s reckless riding. In effect, it would create “ties” for certain positions. So if you were in 5th when you were taken out, you would show as having finished in a tie for 5th with the rider who crossed the line in 5th. It’s racing – not a pension plan. It’s motorcycle racing – not a demolition derby. Don’t feed the troll, Fred.